If your roof is starting to show signs of age, it may be time for a replacement. One of your best options as a homeowner is to take advantage of the situation and opt for metal roofing. A new metal roof is an asset to any home, as it provides a number of unique benefits over traditional asphalt shingles. Where the typical asphalt shingle roof lasts 10 to 20 years, a metal roof is expected to last at least 40. Depending on the exact materials and design, it may even last longer, with some metal roofs making it to 70 years of age without needing to be replaced. If you’re looking for ways to make your home safer, fire-resistant materials should be high on the list. A metal roof is a good defense against fires that start from outside the home due to flying embers. 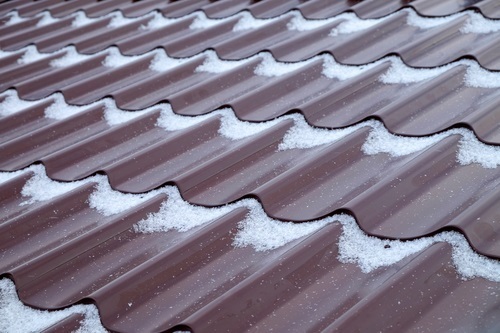 One of the conditions most likely to cause leaks is snow resting on your roofing over a long period, as the snow’s weight and constant presence of slowly melting water can damage your roof. Metal roofing is one of the most efficient options for shedding snow, thanks to its interlocking plates and smooth, hard surface. During the summer, your air conditioning accounts for a major portion of your utility bill. Metal roofing can help lower these costs by reflecting instead of absorbing sunlight. This keeps your roof cooler, which keeps your home cooler in turn—saving you money on your power bill. Compared to tile options, metal roofing is very light. The strength of the metal used in your roof means the panels can be significantly thinner and still do their job. Because of the weight reduction, your roof doesn’t need as much support, making construction simpler. In fact, metal roofing is so light that it can often be applied over an existing roof without removing the original roofing material. If it’s time to replace your roof, choose metal roofing for the new structure. Metal is strong, durable, and provides a wide range of benefits that will save you money and time. Buckeye Home Services is based in Dayton, OH, and serves the Miami Valley with dependable, high-quality home renovations and repairs. Whether you need new metal roofing, concrete pouring, garage door installation, or basement remodeling, their experienced team will help you get the results you want. To discuss your project, call (937) 586-6600 or send a message online.